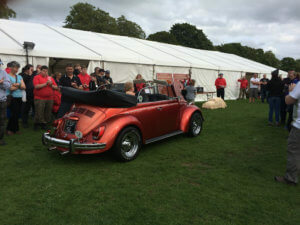 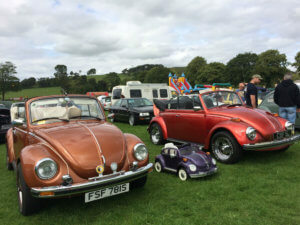 Hundreds of VWs, some badass, many beautiful, all gather in Biggar Agricultural Showground for the last weekend in May (Volksfling) and the final weekend in August (Volksfling Mk2) every year. As these are busy times at V VW C’s we can’t always make it or go for very long, however we had a rare Sunday away from HQ and took Marlyn our Beetle for an adventure in the Borders. 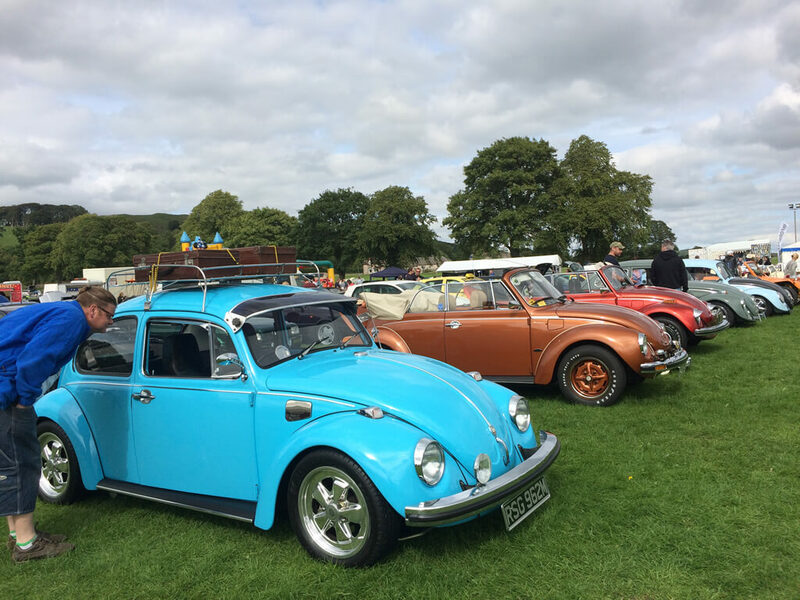 When we arrived, we were greeted by the friendly Volksfling staff and paid the £7 per person day fee. 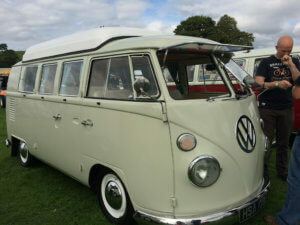 (Lots of others had been there since Friday, with full weekend and camping costing £25.) The smell of petrol, pizza and fresh cut (or perhaps churned) grass mingled in the air. 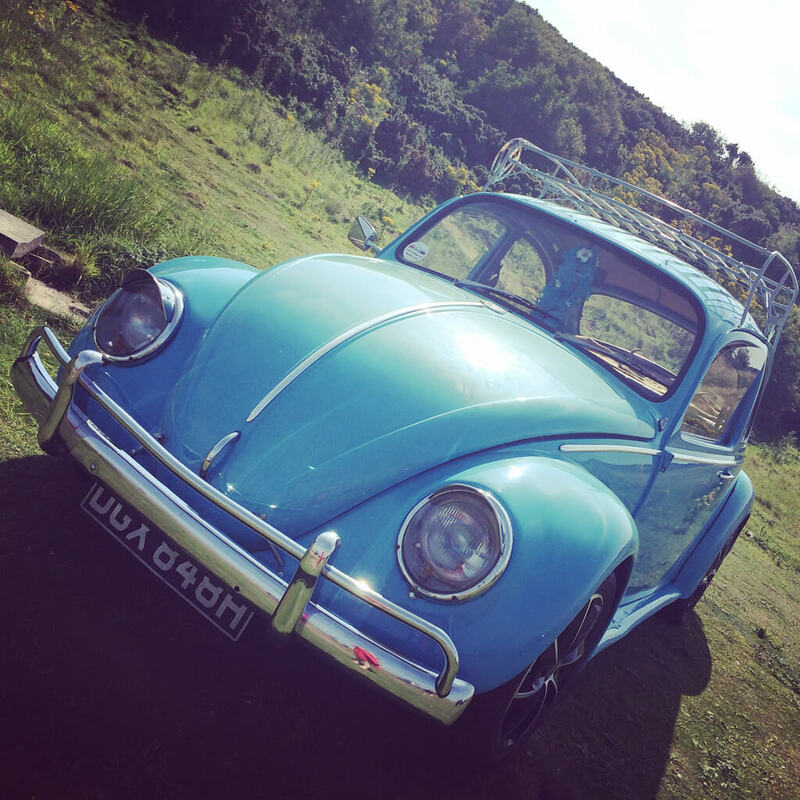 Maybe I was giddy from being off work on a Sunday but it felt like Summer at last! 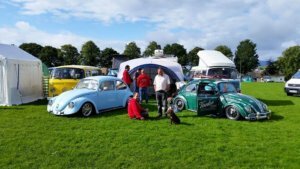 The Lothians Volkswagen Club stand was our first port of call. We were so busy chatting and admiring Jig’s (Club President) Beetle that I forgot to take any photos of the stand. So I’ve borrowed this shot, which I think was taken by Jigs and shows you the line-up there on Saturday. 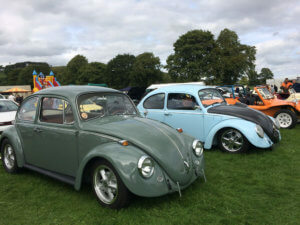 Including the cool green Voodoo Bug, currently up for sale. Jig’s Bug is the pale blue one seen here. Blue Beetles seemed to be popular as ever, even ‘Chainsaw Pete’ AKA Peter Bowsher was using one as a model for his wood carving, which was raffled at the end of the show. 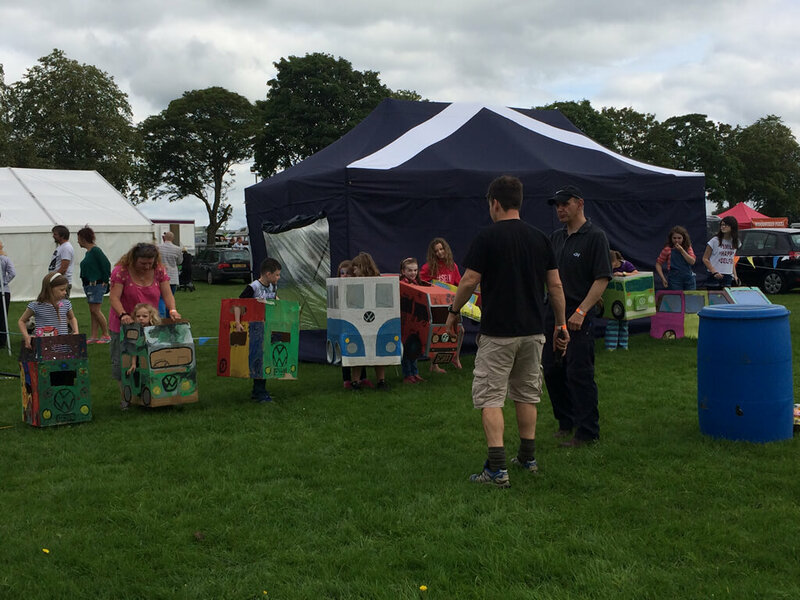 The West of Scotland VW Club organised a cardboard cars race, this is very much a family event with people of all ages enjoying the show. 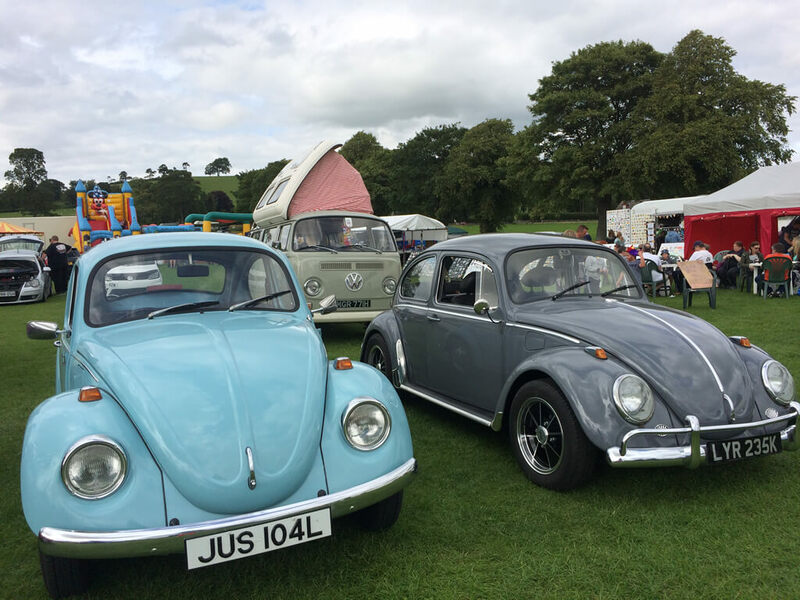 Sunday was Concours day with some beautiful examples of VWs, both air-cooled and water-cooled on display. 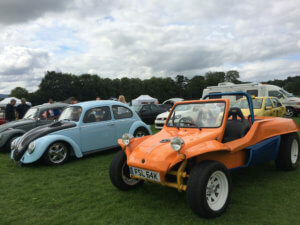 With various traders, from people selling hard to find parts (which may look like heaps of rusty metal to the uninitiated) to stalls selling VW inspired arts & crafts, including our friends at Bespoke Woodcrafts and Liana Marcel Designs, you can get a great retail fix while you are there also. 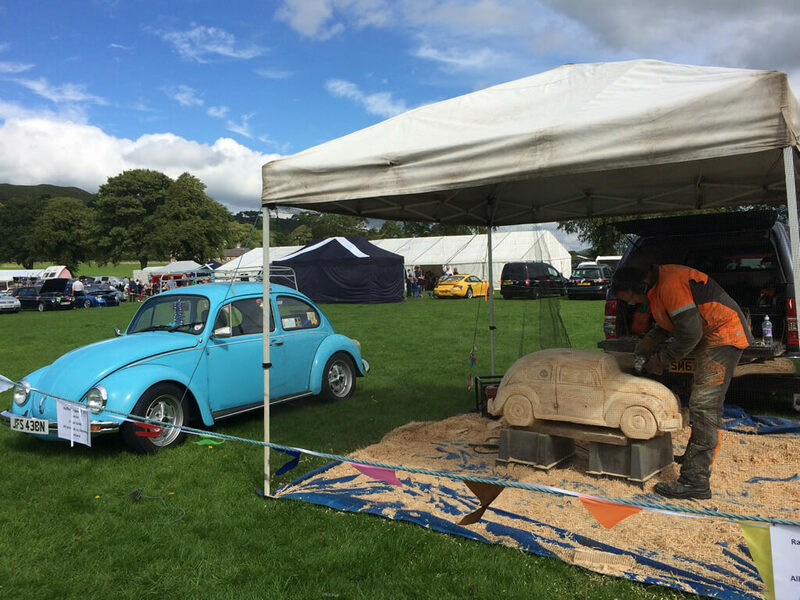 The ‘Best in Show’ was this very worthy winner, who was bagpiped in to join the finished wood-carved Beetle. Prizes were awarded for best air-cooled and water-cooled vehicles but vintage air-cooled won the overall spot. We are now looking forward to 2016! 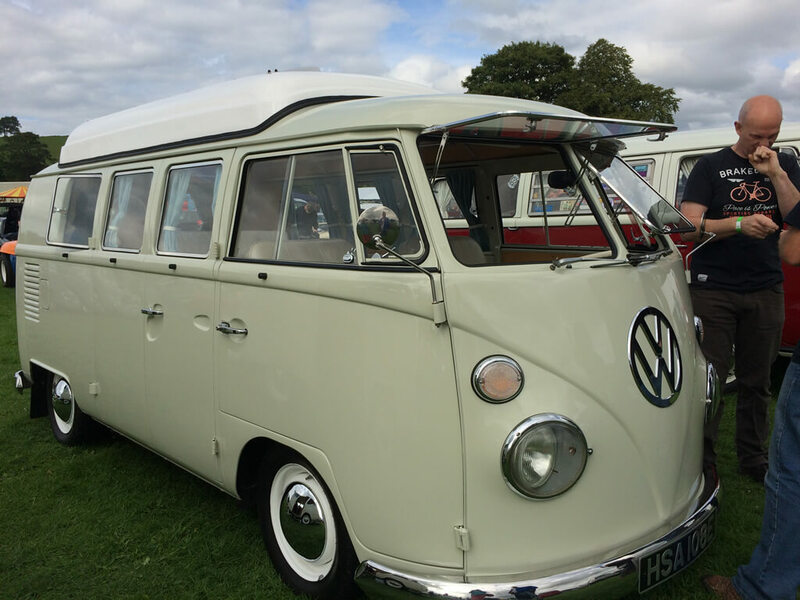 If you would like to plan for 2016 Volksfling, you may want to book our campervans.